2018 in the Polls | More than Ever | Jenkins Research Inc. It was a big year in polling. The 2018 Public Polls Project identified a 5% point increase in the number of polls released compared with a year earlier. And more polls means more online polls as online widened its advantage. 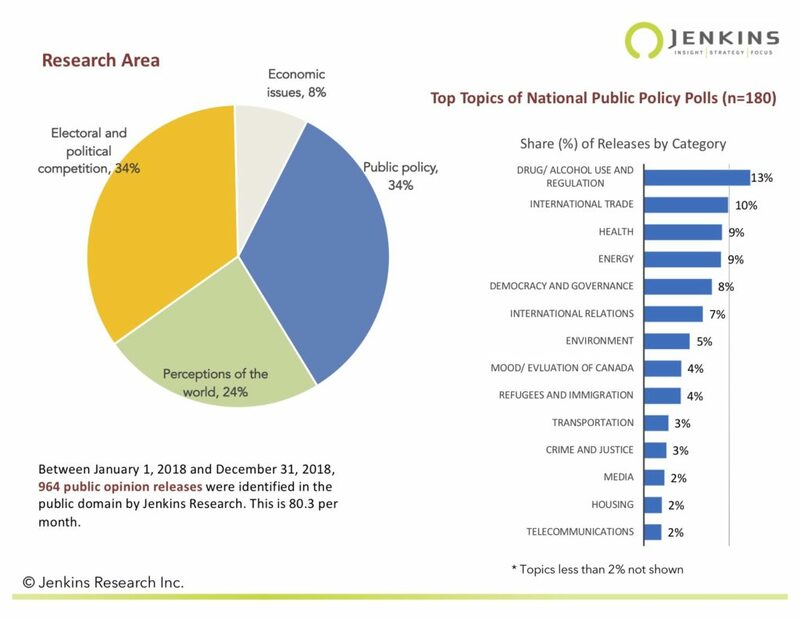 Cannabis and trade were the top public policy issues. Health and energy (pipelines) were not far behind. 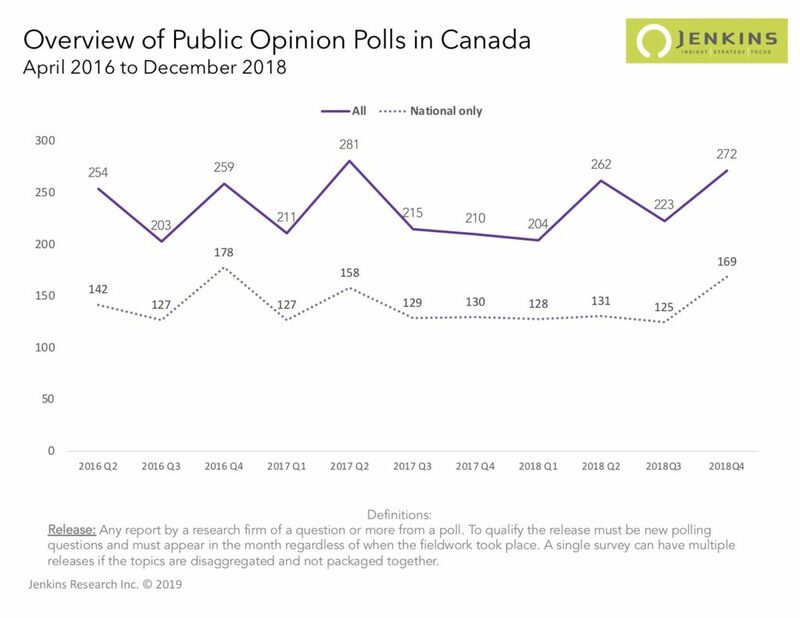 2019 will be a big year for Canadian polling in the lead up to the fall federal election. 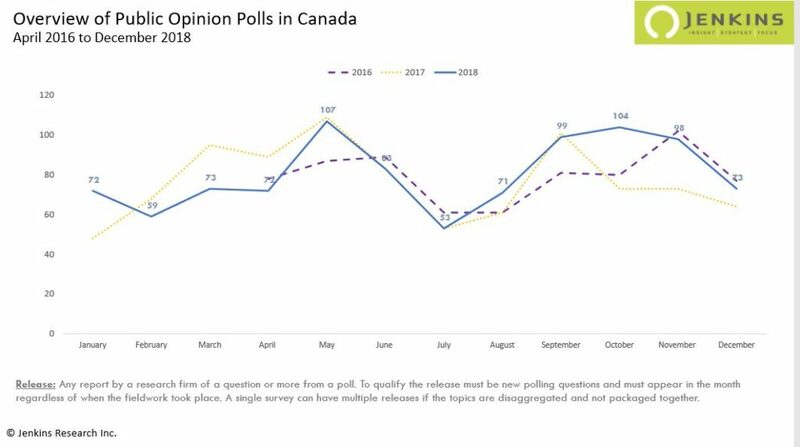 The 2018 Public Polls Project identified 964 public opinion poll releases in Canada. A 5% point increase (917 polls were released in 2017). Elections in Ontario, B.C. and in municipalities across the country may account for the increase. 2018 got off to a slower start than 2017. More polls in 2018 driven by peaks in May and the fall. There are clear seasonal patterns. Poll releases surge in the spring, plummet in the summer, and then peak again in the fall. The 131 national poll releases in Q2 is almost unchanged from Q1 and Q3. The increase came from local and provincial polls. The rise in national polls in Q4 was a departure from recent trends. The 169 releases was the highest since Q4 of 2016. The number of national polls has been stable since 2017Q3 but rose in the last quarter. Public polls tell us a lot about what is on the minds of Canadians. Or at least what media and other elites think should be on the minds of Canadians. Over one third of all 2018 polls were about public policy and another third were about electoral, horserace issues. The perceptions of the world (24%) captures the significant number of polls that lack an obvious policy content. It is the public policy polls that are the most interesting to dig deeper on. Here we find the top issues for 2018 — drugs (read marijuana), international trade (read NAFTA), health, and energy (read pipelines). There was also a lot of polling on how the democratic system works. In this case, the referendum in B.C. served to focus polling attention. Of these, the surprise, if there is one is health. It does not feel like health care dominated the political agenda in the way the other issues did. But, there were polls on pharmacare (5), vaccinations, water quality, diabetes and others that together fit into the health care area. Carbon taxes and pricing, generated, many polls as did Canada’s relationship with other countries. Obviously the U.S. but also Saudi Arabia and China. Online is the most used survey mode in 2018 (64% in 2018). 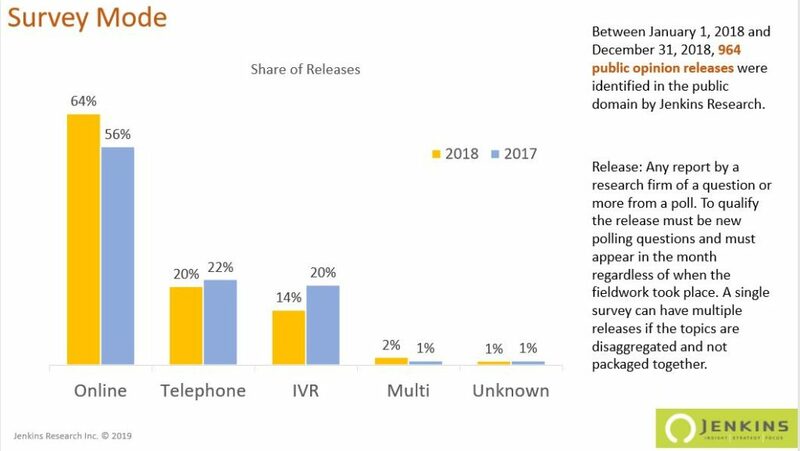 The change has primarily been at the expense of IVR polls which now represent the mode for only 14% of all publicly released polling. The share of telephone surveys actually rose this year. 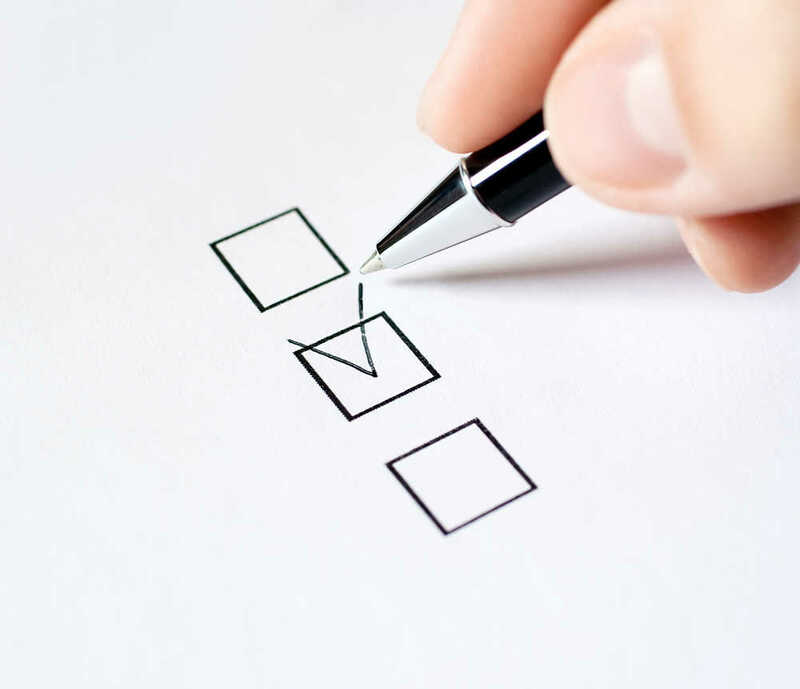 An analysis in the summer of last year showed online is most likely for national polls and for polls about consumer preferences and attitudes (non-policy polls). The Public Polls project was developed and is maintained by Richard Jenkins. Richard Jenkins founded Jenkins Research Inc. and PollingGuru.ca. 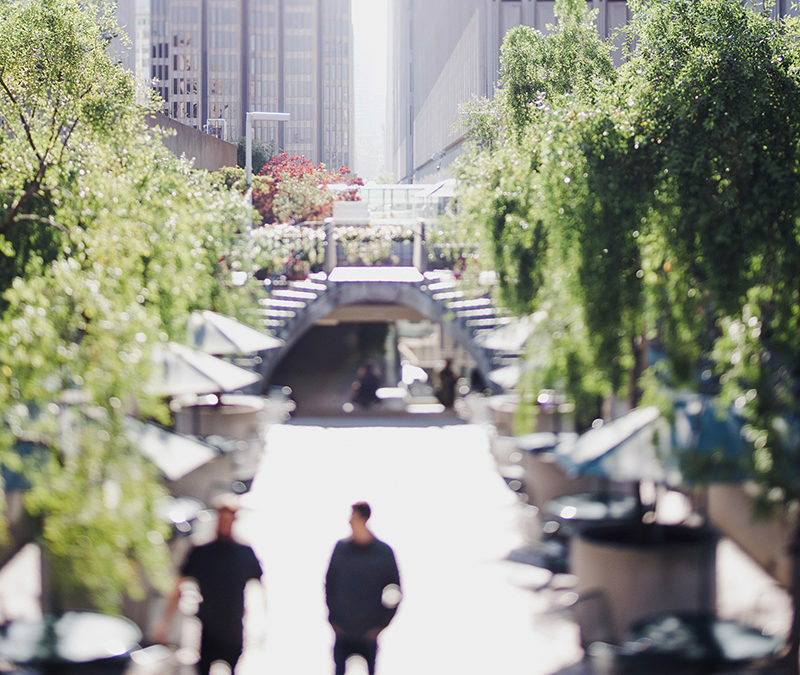 Copyright and ownership of the data and all analysis are held by Richard Jenkins. The database of public polls includes all public opinion releases since April 1, 2016. Each release is an independent public announcement of a question or more from a public opinion poll.